Creamsicle Orange Cheesecake Fluff Salad – this refreshing quick and easy salad is one of my favorite desserts. Cream cheese, Greek yogurt, orange juice and cool whip make this salad so creamy. 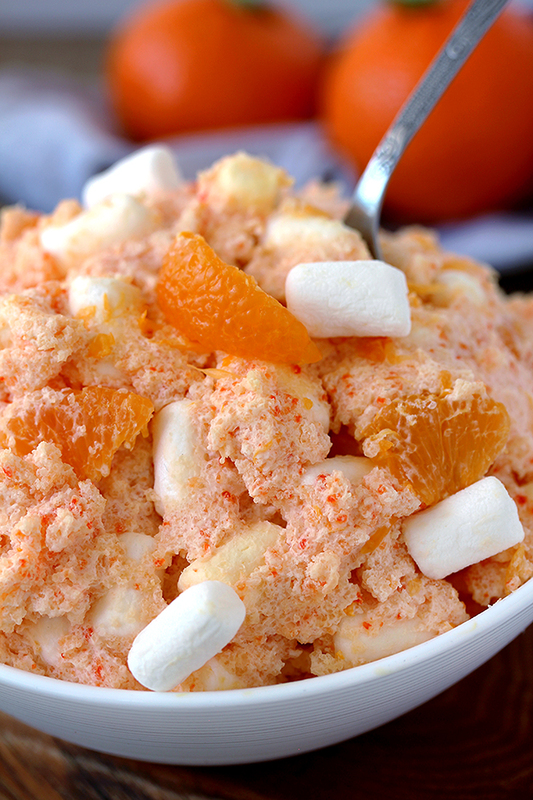 Marshmallow melts in your mouth and mandarin oranges make it refreshing. The combination of all these flavors is out of this world. Creamsicle Orange Cheesecake Fluff Salad is perfect in spring and summer, as well as for holidays and celebrations, like Thanksgiving, Christmas and Easter, or any other occasion. My husband and I really enjoy fluff salads. Whenever we want to have something sweet and refreshing, at the same time, I prepare Creamsicle Orange Cheesecake Fluff Salad. A few simple ingredients are all you need for this recipe. Cream cheese, Greek yogurt, orange juice, orange jello, cool whip, mandarin oranges and mini marshmallows make this dessert divinely delicious. I remember trying this salad for the first time – I was amazed. It was so different and unusual. Although I was a little girl then, I am equally delighted by it today. 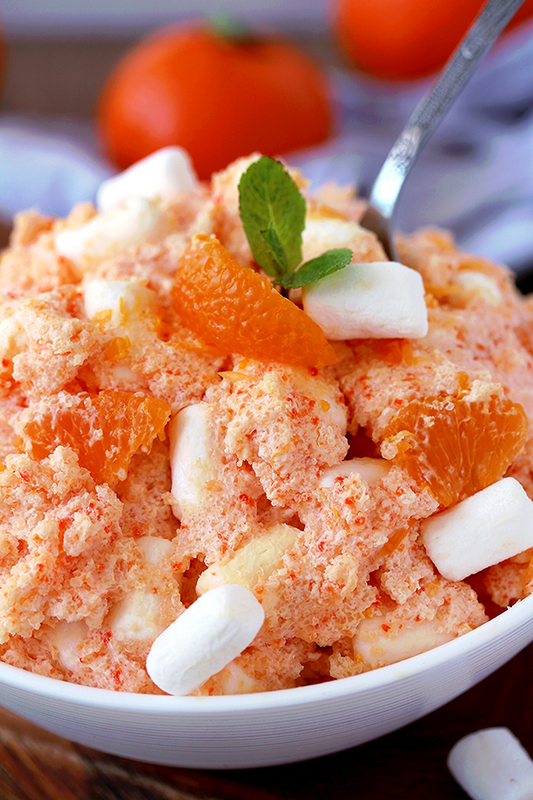 Creamsicle Orange Cheesecake Fluff Salad je is my favorite fluff salad. I enjoy its taste as much as the first time I tried it. The recipe has been slightly modified by me, just to make it perfect for my taste. 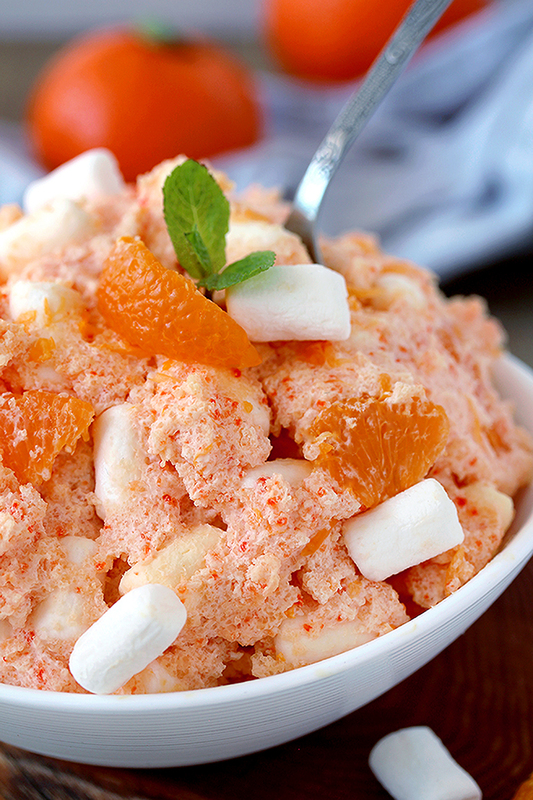 What do you need to make Creamisicle Orange Cheesecake Fluff Salad? 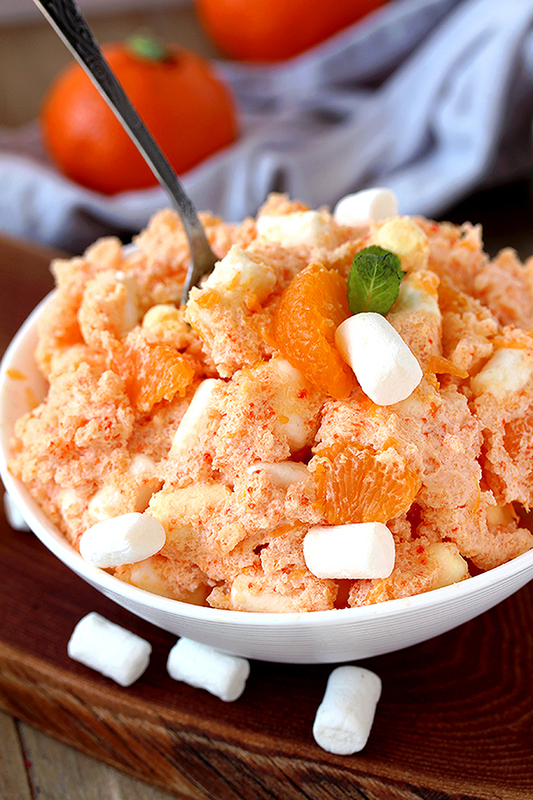 How to prepare Creamisicle Orange Cheesecake Fluff Salad? In a large dish mix cream cheese, Greek yogurt, orange juice, orange jello and vanilla until well combined. Add cool whip and mix. Fold in mini marshmallows and mandarin oranges. As you can see, it is very easy to prepare this salad and it is sooo delicious. If you like fluff salads check out some other interesting recipes Cranberry Cheesecake Fluff Salad, Easy Strawberry Banana Fluff Salad and Strawberry Pineapple Fluff Salad. Easter recipe fans should take a look at our page with EASTER RECIPES. Creamsicle Orange Cheesecake Fluff Salad – this refreshing quick and easy salad is one of my favorite desserts. Cream cheese, Greek yogurt, orange juice and cool whip make this salad so creamy. Marshmallow melts in your mouth and tangerines make it refreshing. In a large dish mix cream cheese, Greek yogurt, orange juice, orange jello, powdered sugar and vanilla until well combined. Add cool whip and mix. Fold in mini marshmallows and Mandarin oranges. Serve fresh, or keep refrigerated before serving.